I have been on the edge on buying this book since it was released, but when I found it on Sale in february I decided to buy it.This is a book that you either love or hate. 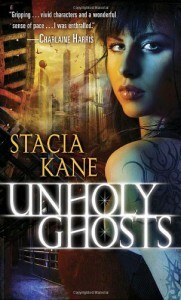 I wanted to love it, since it has a lot of the elements that I love in Urban Fantasy.The world was dark, and gritty. There were several things that fascinated me. One thing were the magic system. I am not sure if I have seen a magic system like it before. I loved the way it used European folklore to banish Ghosts.Another thing that intrigued me was the ghosts, and how their existens were the base of the Church, and employed the Debunkers and Liasons. The plot were filled with unexpected twists. One thing that I liked were that the motives stemmed from pure and simple greed. From Bump's wish to open the airfield, to Chess wish to buy more drugs. The stakes kept growing, and I kept reading to see how the mystery was solved. And the end took me by surpise, yet it made sense.The characters were deliciously flawed. I loved that they showed how different Chess lives were. The upside life were she was a Church Debunker and interacted with Church Elders, Goodys and suburban families. Then there were the Downside life, were she interacted with Terrible, Bump, and street urchins. So what I didn't like. I didn't like Chess. Everything Chess does, she does to earn money to purchase drugs. I'll be honest, this book was very close to becoming an DNF for me, but curiosity made me read on..